The conflict arose after a young monk, Urgyen Trinley, was falsely proclaimed the 17th Gyalwa Karmapa, head of the Karma Kagyu lineage by Tai Situ Rinpoche. Traditionally, the Karmapas are unique among all incarnate Buddhist lamas in that they leave specific instructions detailing their future rebirth. After the 16th Karmapa, Rangjung Rigpe Dorje died in 1981, the entire Kagyu world anxiously awaited word of his reincarnation. In 1992, Situ Rinpoche, officially the third ranking lama in the lineage presented a letter to fellow Kagyu lamas, which he claimed was the “prediction letter” of the 16th Karmapa. Kunzig Shamar Rinpoche, the second ranking lama in the lineage rejected the authenticity of that letter outright and insisted the document undergo a forensic examination. His demands were totally disregarded, particularly after H.H. the Dalai Lama, against all historic tradition, involved himself in the matter and gave his recognition of the candidate. The Chinese Communist Government also gave its full backing to Tai Situ Rinpoche’s candidate and “officially” proclaimed the boy to be a “living buddha”. China’s recognition of Urgyen Trinley represented a sudden about face in its policy of not recognizing the reincarnation of any Buddhist lama. Based on the alleged forged letter, the young nomad boy, Urgyen Trinley was enthroned in Tibet/China. The enthronement took place without the seal of approval of Shamar Rinpoche , the active head of the Karma Kagyu lineage. 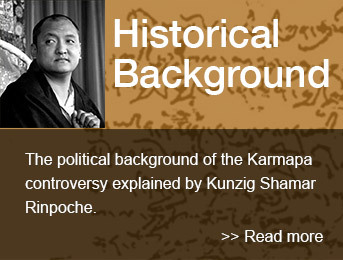 Shamar Rinpoche has repeatedly pointed out to H.H. the Dalai Lama the glaring improprieties in the case and urged him to stay out of what is a strictly Kagyu issue. The 17th Karmapa Thaye Dorje In 1994, Shamar Rinpoche, in accordance with Kagyu tradition, found and recognized Thaye Dorje and proclaimed him the rightful 17th Karmapa. HH Trinley Thaye Dorje is supported by many high ranking lamas of the Karma Kagyu lineage. However, the lineage is presently split into two camps: those following Thaye Dorje and those supporting Urgyen Trinley. To this day, few members of the media have explored the complex issue of Tibetan politics, which led to this turbulent and often violent controversy. As a result of receiving H.H. the Dalai Lama’s stamp of authenticity, much of the Buddhist world has been led to believe that Urgyen Trinley is the sole and legitimate Karmapa. In fact, the Dalai Lamas have never held any right over the confirmation, let alone recognition, of a Karmapa at any time throughout history. Indeed, the Karmapa line precedes that of the Dalai Lamas by over three hundred years and their lineages are and always have been entirely separate. As yet no forensic examination has taken place of the original letter in question in spite of repeated calls by Shamar Rinpoche, and others to do so.